Some of the time, reading is what provokes the inspiration to write. I know that my first inspiration to write came in 5th grade, when I discovered the wonderful world of Bruce Coville. He is a young adult fantasy writer who specialized in writing about unicorns. Needless to say, his ability to create a world unlike any in existence lead me to my passion for writing. However, the love of writing never would have developed, if not for my love of reading. For a few writers, their belief is that writing just happens. You don’t read the work of the competition or important authors before them. They don’t think that taking the time to read is beneficial because they don’t have a love for reading as a foundation. Just think of how many writers you have met that just don’t seem to “get it”. They spend their days sitting at their computer, talking about their ideas, but never seem to get it on the page. 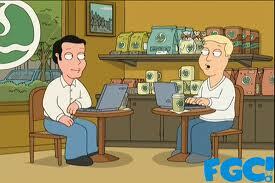 If you've seen this scene from Family Guy, you know these guys don't read to help become better writers. They're tools! No, I’m not talking about the classics, or the stories we reading in high school. I’m talking about influential books for the craft. Authors who have revolutionized your particular genre are vital to understand your own writing. Take for example, my ignorance in the science fiction genre. I haven’t read nearly enough of the classic sci-fi authors. I recently picked up Issac Asimov, and I hadn’t heard of him in great detail before I began searching for great science fiction books to read. Pages into one of his books, I understood the complexity necessary to create a great science fiction book. Within minutes I learned a new facet of the genre I was attempting to write. Some of the most important skills we can learn as writers come from the time spent reading. While the blog post above states that any reading can help, I’m going to focus on just reading in your genre can shape your writing skills. As I have mentioned before I can break down the types of reading into three categories. Reading as a reader (for pleasure), reading as a student (for analysis), and reading as a writer (to absorb skills/ideas). 1.) Reading with a purpose is useless- His first point is imperative to learning from reading. If you read with something in mind (other than reading the book) you’re going to limit the experience. Reading as you would for pleasure is important because it develops your love of reading. 2.) Language is the key to writing- The easiest skill you can learn from other writers is how to handle language. As budding writers, we are clumsy (well I know I am) with language. We don’t have the experience to use our words wisely. So, to gain the experience we read what the best writers have done. At the same time, reading bad use of language teaches us how NOT to write, which is equally important. 3.) Read suggestions from other writers-This element is especially helpful is bringing variety to the normal type of books your read. It also allows you to converse and connect with other writers. This bond is crucial to learning not only from the books, but from the writers who recommend them. I will add only a few additions to his list of how reading helps your writing. 4.) Read contemporary books, and ones in your genre of choice- By reading contemporary books (not necessarily on the best-seller’s list) you learn what books are being chosen by the general audience. You also learn what openings are available in the market for you particular style or ideas. Reading the books in your genre (competition) allows you to understand your audience in an intimate level. For example, werewolves and vampires are HOT in the fantasy genre. While they have always been fairly popular, it is because of one contemporary series ( Twilight ) that has driven trends in the genre. It is vital to know where you fit now in the market as well as what readers look for in stories being published. Make sure you take the ideas of the competition in stride. It’s not meant to change your writing to what they’re doing. You can find the differences an advantage as well as what you could write differently. So, go out and read. Read old books, new ones, and ones your friends tell you are good reads. Speaking of, Goodreads.com is a great place to compare books you’ve read, and get suggestions from people across the globe. Are Blogs Full of Bad Writing? I Sure as Hell Hope Not! Immediately, I became interested in a title like that especially with my new love for blogging and expressing myself in the digital world. I was also offended. Yes, a good writer takes time to create, but I don’t believe everyone (including myself) could be contributing to some of the terrible writing on the internet. I know it’s out there. We see it every day on Facebook and Twitter. The lack of spelling skills and distinction of the correct words in sentences is apparent in a majority of our friends. We thought they were intelligent until we saw what they posted for their status. However, I tend to give a benefit of the doubt for anyone willing to take the time and dedication to write a blog at least once a day. It takes either a good writer or one who relies on the spell check to consistently put out content. Now, whether the content is good quality or not depends on the education of the blogger. I know that some people think they are entitled to write because they have been moderately educated, but sometimes they still don’t know how to do it. I get that those people contribute to the bad writing on the internet. But it can’t be that many people, right? To Kinsley, it’s too many. He details the opinion of a famous financial blogger about the quality of blogging and online writing. Not only has it degraded in quality, but the amount has increased exponentially. So, if you increase the product and reduce the quality, what do you get? A million versions of the same crappy product. Do the consumers (online readers) seem to care or notice? Hell, no and we all know why. Because nobody cares about it anymore. No one is willing to take the time or pay someone to take the time and check for grammatical/any other kind of accuracy. I know that I am nowhere near the perfect writer. I’m not even a good one yet. At least, I admit that I have a lot to learn, and that I am willing to take criticism to learn more. The majority of these people pushing out these crappy quality blogs don’t realize they aren’t writing well AND they don’t care to learn to become better writers. Instead, every consumer (reader) settles for this mediocrity because as long as there is stuff on the internet dumb enough for us to understand, we don’t care if it’s right. By the end of the article, the author describes the reality that all of the qualities of good writing could be overrated. Now, if we are speaking to the new generation and those bad writers on the internet, I agree. To them, it’s overrated because they don’t understand or respect it. Nevertheless, I disagree greatly that the qualities of good writing should just be thrown out because some people think they are exempt from it. Look, these rules of writing were not created to be forgotten just because the medium changes. Instead, the rules should be enforced. Without rules, society has no order. While I believe that some rules can be bent and altered in certain situations, what makes writing good is that people can make a good quality story without cutting corners. It is the people that cut corners that make me sick. The authors that don’t actually follow the rules, but end up selling millions on a book that isn’t very good. I feel like the quality of online writing is simply the tip of the iceberg. It is not only that some people think they don’t have to write well and will be received by readers. It’s that publishers, writers, and readers will make a book popular not because they value the story for what it is, but for its market value. We use the term “selling out” when a writer gives in the requests of the publisher or popular theme because it will make money. Writers write the story that only they can tell a certain way. Not everyone should write a romance just because it’s popular. If that were the case, they wouldn’t all be good. I wish that people could understand that the books on the best-seller’s list are not all good writing. Just because they make money, doesn’t mean it was actually difficult to write. Now, you would like to think that the writers actually worked to create a good story, but most of them are written to make money. And in this age, you don’t have to be complicated to entertain. The quality is down because it doesn’t take good quality to entertain a reader for a few hours. This is such a sad reality because there are so many underrated writers not on the best-seller’s list or not even published because they won’t “sell out” to the most popular idea. It’s become a staple for people to read a best-seller and assume it is good writing because it’s made money. For example, Twilight. Regardless of the people who enjoyed the STORY, which was entertaining I will admit. I read the books to entertain myself and they did the job. That’s it, though. They didn’t make me think, care, or even work hard to read the book. And yet it has made millions. It doesn’t have half of the things that make a good quality book. It may have a catchy, entertaining story, but that doesn’t necessarily make it a good book. The author knew her audience and gave them an entertaining story that took her the least amount of effort and time to write. I bet she spent more time marketing her book (websites, blog that she was good at) than she did actually writing a good quality book. People loved the book. They ate it up like candy. It didn’t matter how it was written anymore. What mattered was if it entertained people enough to buy the whole series and pass it along to their friends. Is this what writing has come to? Wasting the space on the internet just to get a name rather than a quality product out? Filling up our shelves or best-seller’s list with books that entertain, but don’t change lives. Now, I know that I may be scrutinized for my previous sentences about Twilight, but it’s true. From those who have spent years reading hundreds of books and learned how to write well, it is difficult to see something mediocre make millions. We watch the quality diminish and we’re supposed to stay silent because people like it? Bull! I’m not going to sit back and wait for the Stephenie Meyer’s and Michael Kinsley’s accept mediocre writing as our future. I will continue to become a better writer and give a good quality product. No matter how much time I take to write my blog, I know that I’m not diminishing my worth as a writer. I will fight to show people that learning how to write is the most important part of life because it is! Writing, reading, and speaking are the most vital skills we can acquire. They lay the foundation for the rest of our lives. If we allow the quality of these skills to degrade because we’re too lazy to stand up for ourselves, then we deserve to be called bad writers. We can’t just be bystanders as writing is bullied into submission. Stand up and be proud to know how to write!